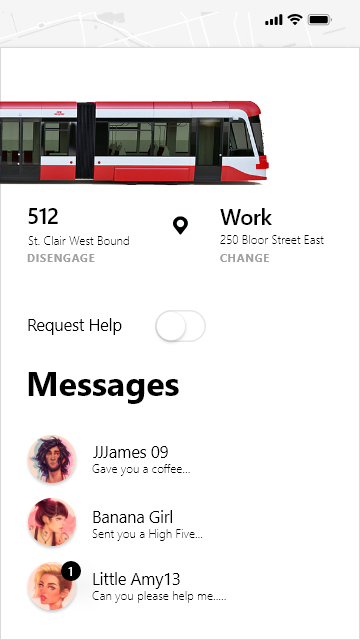 I'm designing a prototype for a mobile app that allows you ask for help inside a public transportation (bus or streetcar). 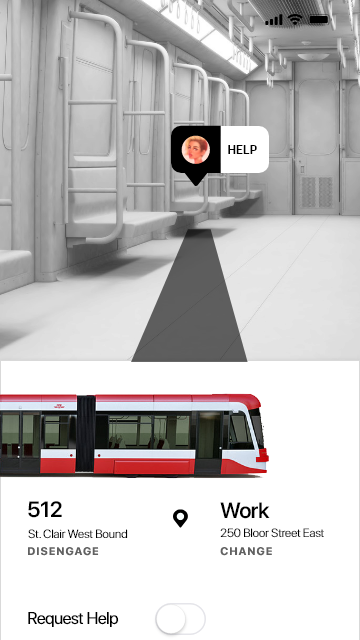 The goal is to alert all passengers that someone needs help inside the same car as they are (so the user doesn't need to contact people individually). Help can be something as simple as the person is feeling sick and needs to a place to sit or someone is harassing them. The button sends a distress signal to everyone in the car (they will get a notification as a personal message). I will display via AR where the person is located (another feature that is not on this prototype) but I'm wondering on whether or not I should place a button or a toggle for "request help". I initially thought about a toggle because it allows you to turn it off if the problem was resolved. I have another version which I replaced "request help" for "send distress signal"
"AR view with distress signal"
Toggle means something long running. What should user expect when the toggle is on? Will it send "Request Help" message only once, or 100, or 1000 times? Will it send "Request Help" messages without any limit even if user forgot to switch it off? Toggle in this case is counterintuitive. Better would be a button. A single press sends a single "Request Help" message. This is more natural. It is easier to understand and to use. Use a button to encourage action. Use text to show status of the event or issue. Once the issue is flagged by the system, the button area (or next to it) can change to a resolution or status message. The important thing in this app, is to show context and state for people in the same physical area. Someone sitting right next to a person in distress can clearly see what's going on; this does not mean that others at the end of the car can. individuals are less likely to offer help to a victim when other people are present. The greater the number of bystanders, the less likely it is that any one of them will help. Several factors contribute to the bystander effect, including ambiguity, cohesiveness and diffusion of responsibility. What you want to do in this situation is to give people situational awareness, and call for action if no one else has. Remember; if the situation is someone getting harassed or feeling threatened, they may be too scared to call for help. Someone out of the field of view of the assailant can discreetly call. What you don't want is everyone just assuming that someone else has (or will) alert the authorities or help. A button is a discreet action; a toggle is often a view preference or state toggle. If the goal is to allow action (calling for help), use a button. 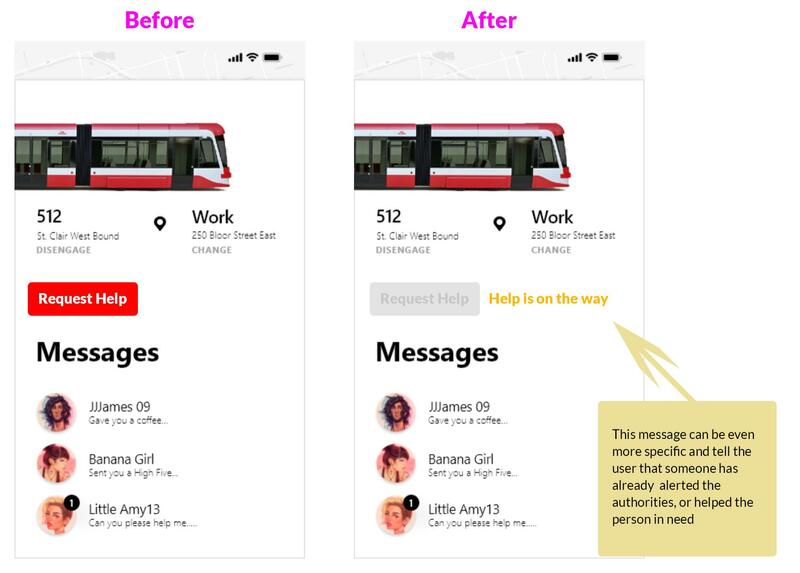 The disabling of the button (combined with a clear message that help has been called for), will allow users to understand the state of the situation. Not the answer you're looking for? Browse other questions tagged gui-design mobile buttons design-patterns or ask your own question. Best place for grid/list toggle button?